To be able to monitor and administer from a centralised control room. To send mssgs back and forth to the dispatchee via a mobile data terminal (MDT) with help of automation. AssetCo Data Solutions expertise in Patient Transport Systems solutions includes the whole specialist area of non-emergency patient transport. AssetCo can provide a wide range of consultancy and project management support skills using Prince2 trained staff. 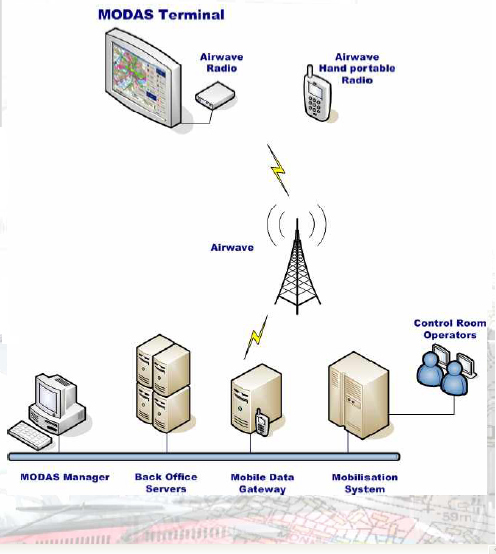 MODAS is a mobile data solution which empowers operational personnel to have information where they need it, and when they need it, typically in the vehicle. Crews can access up-to-date information, such as Risk Data, Hydrant Data, GIS and HAZCHEM Data. UK Fire & Rescue Services. Post Trust Merger UK NHS Ambulance Trusts.